by Raymond Balze, lower right in graphite: ces croquis preparatoire a un tablea / autre que le portrait costumé / du Musée du Louvre. ; by Raymond Balze, lower left in graphite: Dessins pour Le plutarche français; lower center in graphite: note de R. Balze. Ingres' pupil, Raymond Balze, 1818-? ; Morin collection (sale, R.W.P. de Vries, Amsterdam, 10-11 May 1927, no. 256); Sale, R.W.P. de Vries, Amsterdam, 1929 (according to 1953 sale cat. ); Sale, R.W.P. de Vries, Amsterdam, 21-23 February 1933, no. 1011. Sale, Ketterer, Stuttgarter Kunstkabinett, Stuttgart, 20 May 1953, no. 709; Curtis O. Baer; his son, Dr. George Baer, Atlanta; his daughter, Katherine Baer; gift to NGA, 2002. Ingres Centennial Exhibition, 1867 - 1967, Fogg Art Museum, Cambridge, 1967, no. 92. Classicism and Romanticism, French Drawings and Prints, 1800 - 1860, Metropolitan Museum of Art, New York, 1970, no. 55. Drawings from Georgia Collections, High Museum of Art, Atlanta, 1981, no. 2. Master Drawings from Titian to Picasso: The Curtis O. Baer Collection, NGA; Indianapolis Museum of Art; John and Mable Ringling Museum of Art, Sarasota; High Museum of Art, Atlanta; Walters Art Gallery, Baltimore; 1985 - 1987, no. 67. 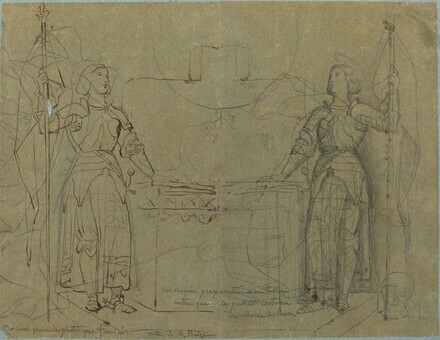 "Joan of Arc: Her Image in France and America", The Corcoran Gallery of Art, Washington, 2006-2007.